The aim of the Books & City Series is to encourage students’ polymathic study, to gather knowledge, not only by expanding beyond the borders of countries, but also time and different subjects. Speakers like writers, journalist and faculty from academic departments are invited to share with students. Through this event, we hope to promote reading from the perspective of speakers from various fields as well as to promote library resources. 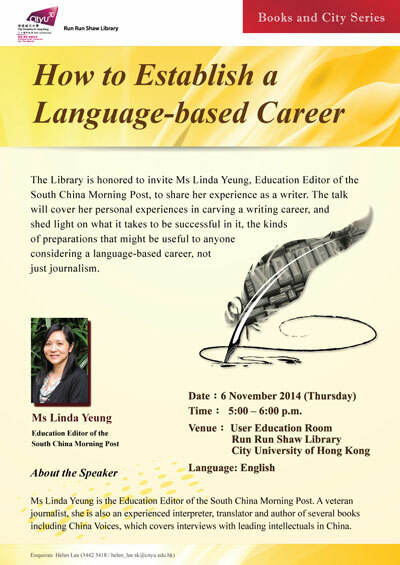 The Library was honored to have invited Ms. Linda Yeung, Education Editor of the South China Morning Post, to share her career as a professional writer on 6 Nov 2014. Ms. Yeung is a veteran journalist and she is also an experienced interpreter, translator and authors of several books covering interviews with leading intellectuals in China. In this talk, she shared her personal experience in carving a writing career, her education background, the field of language-related career, benefits of being a professional writer, and the kinds of preparations needed for students who are considering a language-based career. Students from the language discipline raised questions on how to improve their language skills and Ms. Yeung advised them to read widely so as to expand their word power as well as knowledge. Are You a Language Major?